Posted on December 4, 2012 at 00:50. Here at Streamio, we absolutely love the new version of Basecamp (www.basecamp.com) by 37Signals and we use it frequently to manage many of our internal and customer projects. The only thing we found a bit frustrating was that we couldn’t embed any videos in our projects – well, we could, but only videos publicly hosted at YouTube or Vimeo. But what if you, like us, wanted to embed videos that were not publicly hosted? What if the content we wanted to embed was not something we wanted anybody else but the members of a specific project team to see? Well, thanks to the awesome teams at 37Signals and Embed.ly, it is now possible for all our customers to embed HD videos hosted at Streamio directly in the new version of Basecamp! Paste the embed link / shortened link and publish your discussion / comment. 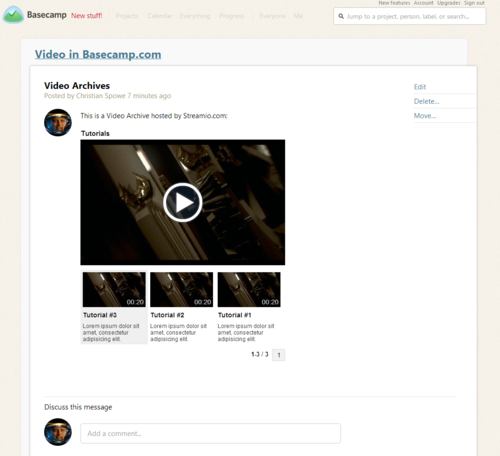 Now, the video will automatically be embedded in Basecamp and viewable by all members of that project. Sweet!! Then, you just locate and copy the Embed link / shortened URL of your Video Archive Player and paste it in any Basecamp discussion/comment, as previously described for single videos. We certainly hope that you will love this neat feature as much as we do and, again, a huge thanks to the awesome teams at 37signals and Embed.ly for making this possible. Please note that this neat auto-embed feature only works in Basecamp’s Standard view, not (yet) in Basecamp Mobile. You can still view all videos and archives on all kinds of tablets, including iPads, as long as you work in Basecamp Standard View – in Basecamp Mobile, the videos and video archives will only be displayed as clickable links/URLs, not embedded.